I know, if you’re hopped online in that last few years you’ll have realized there seems to be a course for everything. 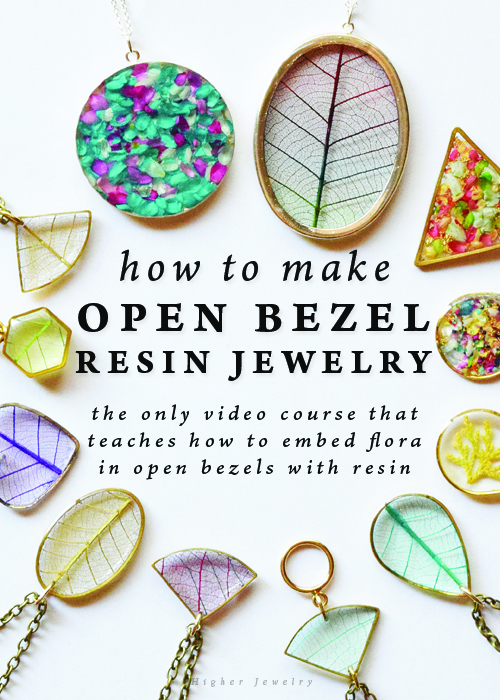 Watercoloring and acting and playing tennis—but, to my knowledge, there wasn’t an online course for open bezel resin jewelry. For resin jewelry in general. So, after throwing out unusable pieces and ruining my curtains, I kept going. Learning from trial and error. And eventually I worked out a system and a method. Having learned the ins and outs, it was easier, simpler, and less wasteful. And it made sense to teach about it. Growing up, there’s 2 distinct things I remember loving to do consistently: writing stories in secret and pretending to teach classes in the mirror or the shower. Also in secret. In fact, everything I’ve every learned I’ve always clamored to share with those around me. So, I share everything—every secret, every step—in the Resin Jewelry Making course. After years of working on this craft, I decided to make the online course for this thing. And I’m straight up with everyone I tell about this e-course—I don’t believe anyone needs an online course for anything. Obviously, I learned without guidance, structure, a teacher, etc. And what about the millions of random tutorials that can be found online? What about YouTube? I made my video course to make it simple to go from A to Z. With much less trial and error. With guidance, structure, a proven method, and a teacher who answers your questions—for people who don’t want to wait, who don’t have time to waste, who want step-by-step and ease. It’s really nothing fancy—I don’t believe in bells and whistles. You just need the information as quickly and succinctly as possible. All lessons are about 10 minutes or under. They’re edited down, narrated, and visual. You watch over my shoulder and I explain everything I do and why. Resin jewelry using open back bezels and natural flora. When I was learning, and even in recent times, I’ve noticed free tutorials didn’t skew towards really creating high-quality or gave in-depth advice (I tried to learn with free tutorials and still felt really lost). And if I’m being honest—I didn’t like the style of a lot of free tutorials. I didn’t want glitter and random findings—I wanted to be intentional and really focus on simplicity and celebrating nature’s beauty. The skills can be expanded upon, the basics are solid, and there’s tons of bonus lessons to diversify your knowledge and craft. And I add to it. There’s new bonus lessons being worked on even today—2 years after I first created this e-course. This is the first course of it’s kind, and I’m pretty happy to share it. Yeah, I’m blatantly selling—because what’s a course without students? And as I’ve heard from students already inside the course—there’s people out there who want this course and have been looking for it. Click here to enroll in my free email course, Resin Jewelry Basics. Click here to access the Open Bezel Directory. Click here to visit the blog, where I write about making resin jewelry and other DIY jewelry projects. Click here to read my most popular blog post: 8 Ways to Rid of Bubbles in Epoxy Resin. But my jam-packed, in-depth video course is the most succinct and structured way to learn. Step by step instruction as you literally watch over my shoulder—and, every lesson is about 5 to 10 minutes long. You could watch everything, even the bonus classes, within one day. With the skills you’ll learn, you’ll be ready to create your own style and designs, add to your jewelry box the most perfect pieces you can dream up, whip up special gifts for friends and family this holiday season, or—if it’s your thing—go on to create your own distinct look and sell your crafts. I hope you go on to make beautiful things, with or without my course.